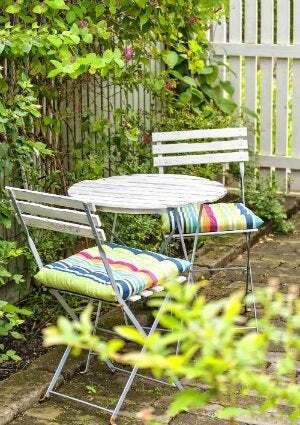 Now's the time to freshen up your outdoor seating before the season kicks into full swing. While most cushions can't be tossed directly into the washing machine, you can get the job done without even moving them from your porch or patio! Read on for the how-to. When it comes time to spiff up your porch or patio for spring, cleaning outdoor furniture ranks high on the to-do list—particularly if those cushions have been out in the elements all winter long. All that exposure to moisture doesn’t bode well for these comfy pieces when it comes to mildew potential. Fortunately, many cushions are designed with removable covers that can be slipped off and thrown into the washing machine on gentle cycle. (Thank goodness for zippered slipcovers!) But even if yours don’t have removable covers, you can still get your cushions clean in preparation for a summer of outdoor fun—just follow these simple steps. 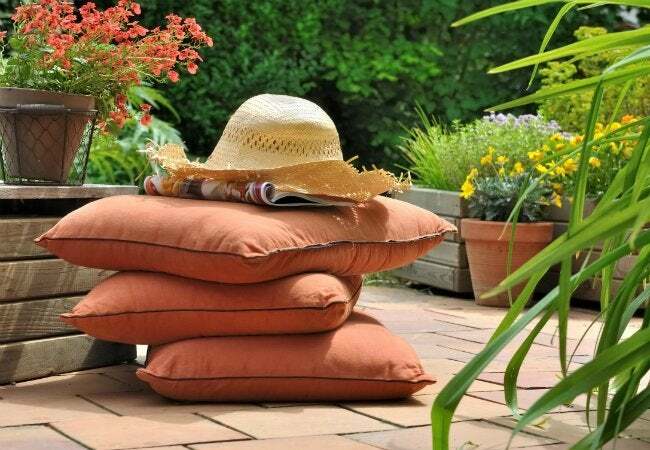 Pile up your outdoor pillows! Unzip cases wherever possible and run them through the wash following the instructions on the tags, then turn your attention to the cushions. Remove any loose dirt and dust from them using the upholstery attachment on your vacuum. If your cushions are tufted, be sure to run the attachment carefully over the crevices, seams, and any buttons. Next, mix 1 tablespoon of dishwashing liquid in a bucket of warm water. If your cushions have mildew on them, add 1/4 cup of borax to the solution as well. Generously sponge the sudsy solution onto your cushions, and let them soak for 15 minutes. Still see stubborn dirty spots after soaking? Apply more of the cleaning solution, then gently rub out the spots with a scrub brush. Wrap a towel around the cushion to blot up the majority of the water, and then stand the cushion up on end to air-dry completely. Make sure no moisture remains, otherwise you’ll find yourself facing a regrowth of mildew. Pull out the blow dryer, if you need to! Once your cushions are dry, spray them with a fabric protector, such as Scotchgard Water & Sun Shield (available on Amazon), to help them resist dirt and stains from such summery things as spilled fruit punch and dripping popsicles. Taking this step now will make it much easier to keep those cushions clean the rest of the summer! Getting your outdoor space ready for the season can be a lot of work, but it’s well worth the effort. Once you’re finished, you can sit back and relax with friends and family, enjoy a summer smoothie or some barbecue, and wait for the twinkling fireflies to appear.